UNITED NATIONS, June 3, updated -- The IMF, despite claims of increased transparency, picks and chooses which press questions to answer or even acknowledge. Based on recent evidence, those excluded involve poorer countries, and the IMF's own scandals. On May 26, Inner City Press asked the IMF in writing "how does the violence in Jamaica impact the IMF's program with the country, and on the IMF's view of the country's economic prospects?" But the IMF never answered, even when the question was repeated. So, during the IMF's June 3 fortnightly press briefing, Inner City Press submitted the question, plus one about charges against the IMF's Resident Representative in Pakistan, Paul Ross. But the IMF's David Hawley, while taking other online questions, never mentioned these two. Immediately after the abbreviated IMF briefing, an IMF staffer belatedly offered answers, but only to the Jamaica question. It was as if the Pakistan question about Mr. Paul Ross was never asked, simply did not exist. "As regards Jamaica, you can attribute the following to an IMF spokesperson: 'We remain confident in the government’s economic program and its desire to implement the measures it has set out in this program.'" Couldn't that platitude have been issued back on May 26? Or did the IMF not have confidence at that time? "On Pakistan, what would be the IMF's view of a 7% power tariff increase? Please provide IMF comment on the legal status of Pakistan Res Rep Paul Ross, and IMF position on domestic abuse." While the IMF has previously deigned to answer questions about Pakistan power tariffs, once complained with a question about the accountability of the IMF's own officials, suddenly it is as if the question was never asked at all. 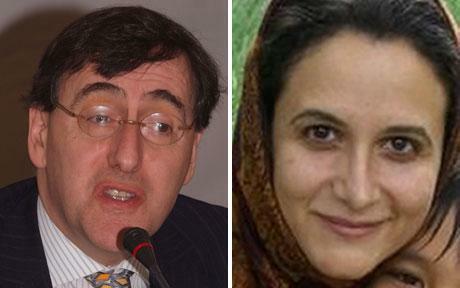 The British head of the International Monetary Fund in Islamabad has been accused of assaulting his wife by having her removed from the family home but he cannot be charged due to his “diplomatic immunity” status. Deena Shehata, 28, claims she was “manhandled” and forced from her home by her husband Paul Ross, but police were unable to do anything because of her husband’s job status. The couple married in July 2007 and moved to Pakistan a year later when Mr Ross, 51, from Wembley, was appointed the IMF’s Resident Representative in Pakistan, in charge of an $11 billion (£7.5 billion) economic stabilisation programme. Holders of such posts usually carry a United Nations diplomatic passport. The couple’s marriage allegedly broke down and Miss Shehata said she returned to their home — a smart two-storey villa, protected by guards and barbed wire, in an area of the city popular with wealthy expats — on Friday to collect some of her belongings. She alleges that her husband grew impatient before forcing her out of the house. “I was humiliated as my husband asked our guards to remove me from my own home,” she wrote in a statement for police. Miss Shehata, a British-born academic, said she was desperate to leave Pakistan as soon as possible. She said she was disappointed at the way police handled the case, and that appeals for help to the IMF had not helped her find justice. “The best solution they have is to get me out of here quickly and safely,” she said, adding that the system seemed to want her removed from the scene like a “broken toy” rather than questioning her husband. Sub Inspector Abbas, the police officer dealing with the case said that as soon as they found out that Mr Ross had diplomatic status they abandoned the case. He said they took a statement from Miss Shehata and did not investigate any further. Miss Shehata’s supporters said yesterday that they would take the case to Pakistan’s ministry of foreign affairs. Ms. Jahangir has held a UN special rapporteur post. So perhaps if the IMF won't even comment, the issue can be pursued through the UN, including on the question Laissez Passer passports. Watch this site. Footnote: refusing or cherry picking online questions appears to be a hallmark of Mr. Hawley. He took no online questions, including one Inner City Press submitted about Pakistan, on February 18 of this year. The Sri Lanka question submitted was never answered. And so it goes at the IMF -- no accountability. "Many thanks for your inquiry as regards Pakistan. You can attribute the answer below to an IMF spokesperson: 'We take any allegations related to staff conduct seriously and the Fund’s independent Ethics Advisor is investigating the facts.'" UNITED NATIONS, February 18, updated -- The IMF board will vote tomorrow on Zimbabwe's request to regain voting rights, the IMF's David Hawley said at the organization's biweekly media briefing on February 18. While not taking any online questions, Hawley fielded repeated questions about Greece, essentially backing away from Dominique Strauss-Kahn's previous blustered about the IMF being ready to intervene. 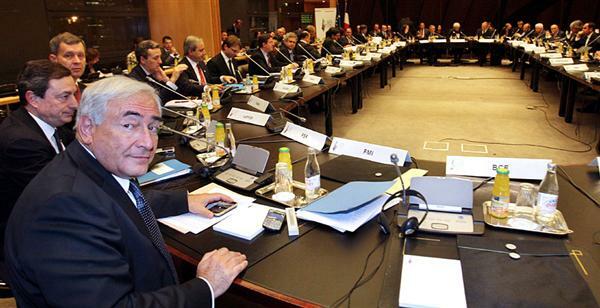 Pundits says the Europeans want to keep the IMF out -- Germany because it wants to retain the centrality of a European process it is about to head, France's Sarkozy because he does not want Strauss-Kahn to become any more prominent before the 2012 elections. While Strauss-Kahn's IMF preaches to developing and troubled countries, it cannot comply with its commitment to conduct an online media briefing every two weeks. On February 18, the IMF's David Hawley presided over an ill-attended session in the organization's new briefing room. His colleague Caroline Atkinson had inaugurated the room by saying it should make online participation easier and more seamless. But on February 18, despite online questions being submitted by Inner City Press and surely others, Mr. Hawley did not acknowledge or answer a single online question. Nor in the twenty minutes between the briefing and the expiration of the IMF's embargo did the IMF answer a request for an explanation of the freeze-out. On Pakistan, does the IMF's recent announcement mean that the bank supervision and power tariff goals have been met? Regarding Cote d'Ivoire, how does the IMF view the suspension of the government and further delay of elections by Laurent Gbagbo? With an IMF team in Sri Lanka, what is the IMF's thinking on the EU's suspension of the GSP Plus tariff treatment, and/or the arrest of opposition politician Sarath Fonseka? On other matters, Hawley said he would not speculate or comment about the motivations of Central Banks. Fine -- but why can't the IMF, despite the spending on its new briefing room, manage to acknowledge and answer online questions about its operations? Watch this site. I have asked the press officers to review your questions and get back to you where possible. Most of the questions contained stuff that fell far afield of the IMF's role or mandate. So where we can answer we will, but a big chunk of your questions could be better answered by institutions not focused on financial and macroeconomic issues. Well, no. As linked to in the questions above, the IMF has a team in Sri Lanka, has opined on power tariffs and bank supervision in Pakistan -- in fact, Inner City Press got answers on those questions on a previous IMF conference call -- and is reviewing Cote d'Ivoire. The IMF's attempt to portray itself as divorced from politics, conditionality, and governance is ham-handed and illegitimate. It is not for the IMF to decide which questions to acknowledge or not. Or, who in the IMF makes these decisions, and on what basis? Watch this site. The reforms to strengthen the effectiveness of banking supervision in Pakistan are proceeding as envisaged. The parliament is discussing amendments to the banking law. The lower house has approved the amendments and they are being discussed by the upper house. Electricity reform is also proceeding, but somewhat slower than planned earlier due to delays in implementing certain tariff adjustments. Matthew, Further to your question on Côte d’Ivoire, I’m afraid it’s still too early to say. You can attribute the following to me if it’s helpful. Apparently the question about Sri Lanka, where the IMF current has a team on the ground, was deemed even less IMF relevant that this. Watch this site.